Gurgaon-based Oku Tech Pvt Ltd, which operates collaboration platform for brokers BroEx, has raised $1 million (Rs 6.4 crore) in seed funding from Lightspeed India. Founded in 2014 by Pallav Pandey and Mukul Kumar, Oku Tech will use the funds raised to expand presence into tier I, II and III cities in India, as per a press statement. The company is also planning to invest in product development and launch complimentary products and services for brokers to facilitate transactions, it said. "We are re-imagining the real estate opportunity in India with the broker at the centre of the universe. This round of funding will help us consolidate our position as the preferred network and channel of communication for brokers and also get us ready to power transactions through our platform," said Pandey, who is also CEO of the company. 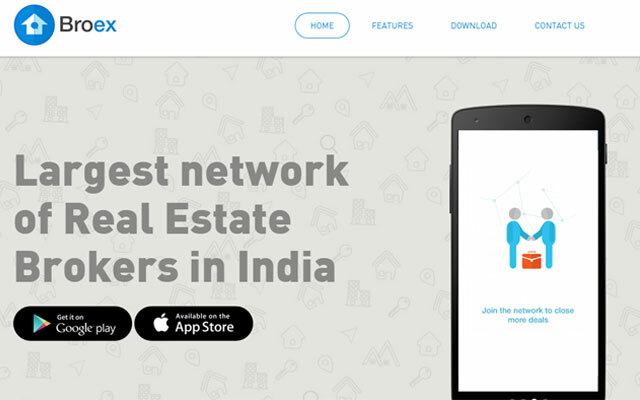 BroEx is a networking app which helps real estate brokers in finding inventories and requirements with trusted peers in and beyond their network. Brokers can use the BroEx network for connecting and sharing information to access accurate sale and rental listings and for faster closure of deals. At present, BroEx claims its network is leveraged by 25,000 brokers across major cities such as Delhi-NCR, Mumbai, Bangalore, Pune, Ahmedabad and Jaipur. The real estate brokerage market in India is currently dominated by 500,000 independent brokers and agencies and generates $4 billion in brokerage fee income for real estate sales and rentals annually, BroEx estimates. The online property related services market has become red hot with several new generation property classifieds sites and online brokerage ventures raising VC money. Then there are a string of other startups trying to disrupt the market. Early this week, Bangalore-based Nestaway Technologies Pvt Ltd, which runs an online managed home rental marketplace for singles by the same name, raised Rs 76 crore (approximately $12 million) in funding from consumer e-commerce venture Flipkart and its investor Tiger Global. Recently, online peer-to-peer home rental portal NoBroker.com raised $3 million in Series A round of funding led by SAIF Partners and Fulcrum Ventures. Many startups aim to replace the broker or capture their brokerage fee. But Oku Tech believes that brokers will continue to be pivotal for powering complex, high-value real estate transactions and the company has chosen to use technology to partner with brokers across India to solve their problems. "Real estate in India is a deep and relatively untapped opportunity with a number of unsolved problems. We believe that the experienced founding team at Oku Tech, combined with the company's mobile-first network effects model and being the market's largest broker network, is a very solid foundation to disrupt the current status quo in the market," said Dev Khare, managing director at Lightspeed India. Lightspeed has invested in around a dozen Indian companies, including online market place for ethnic apparel and handicraft Craftsvilla, music streaming service Dhingana (acquired by Rdio in 2014), lifestyle e-tailer Fashionara, Indian Energy Exchange, prepaid cash card company Itz Cash, social commerce platform LimeRoad, financial services and consumer protection platform OneAssist, among others. In May, the VC firm said it is raising $115 million (Rs 734 crore) in an India-specific fund. Till now Lightspeed had been investing in the country from its global fund, though it also has country specific funds for China. BroEx Lightspeed India Partners I LLC Oku Tech Pvt. Ltd.